The year is 1909, and Temperance O'Neil is a woman ahead of her time. At 29, she is happily married to her work helping single mothers on the streets of New York. Unfortunately, Angus McCairn -- her new stepfather -- controls the purse strings to her substantial inheritance. Angus insists she quit her career and live in his house in Edinburgh. Temperance heads for Scotland with one mission -- to drive Angus crazy. Angus asks her to pose as housekeeper to Angus' nephew, James, in a secret attempt to find him a wife. If she succeeds in matchmaking, she will be allowed to return to New York. Although James McCairn is Laird of Clan McCairn, he's no cultured gentleman -- he's a strapping, rough-mannered giant interested only in farming. His stables are immaculate, his horses gleam with care, and he lavishes personal attention on his sheep -- but there are pigeons roosting in the kitchen and chickens in the bedrooms. Temperance, is determined to win her return passage at any cost. But the cost may be her heart...for as Temperance O'Neil attempts to open James' eyes to the wonders of love, it is she herself who is liberated -- by the power of an overwhelming passion. I really didn't like this book at all. Nothing exciting happened and it was predictable. I had a hard time remembering what the book was about when attempting to write this review. This was a predictable read but moved enough to keep my mind off the long commute. 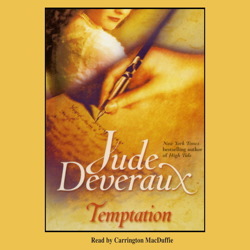 Jude Deveraux has always been one of my favorite romance authors, but I wasn't sure how I would like listening to her book instead of reading. I enjoyed all the way through the book, but I was disapointed in the ending. I expected more. I suppose I agree with some of the previous reviews that this is a somewhat predicable story. But it is a Jude Deveraux story. Her stories are not intense fiction or murder mysteries. This is a cute and sometimes funny love story. It takes me away from my everyday life and makes me smile. And Jude Deveraux's books always make me smile. I thought about someone else's life and forgot my troubles for awhile. And that is why I loved this book. Thanks again Ms. Deveraux. You made this week at work very enjoyable. Two stars for the effort of the reader! The story was VERY predictable and the accents were a bit over the top! The main character, Temperance, was not a very likable person. Her mother and step-father were ... vague. I think my time could have been better spent washing my hair. Loved it! Jude Deveraux' books are great. I like the mix of romance and mystory. I listened to about 90 minutes of this and had to stop. The story is childish, predictable and simplistic, but that's not even the worst part. The accent of the Scottish characters is terrible, to the point that I couldn't keep listening. Additionally, did NO-ONE in the entire production process, point out to the reader that the city of Edinburgh is pronounced "Edinbruh", not "EdinburG"? If you're going to take on another accent, at least learn how to pronounce the names of the major cities. Light, fun to listen to. An inbetween break from every day life.